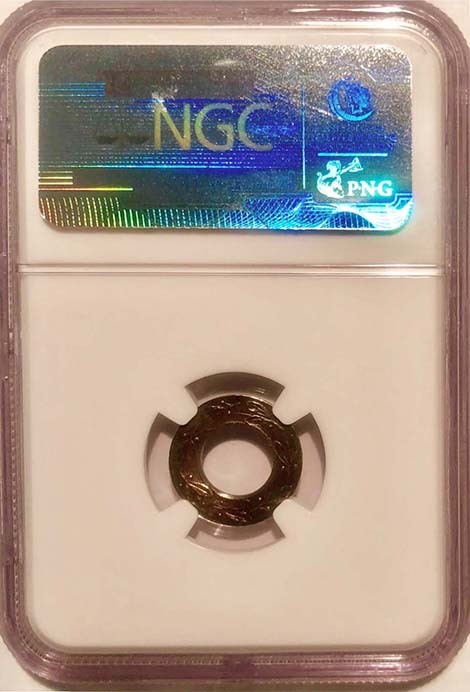 NGC authenticated and certified this unique pattern and CAC approved it. It is the only known U.S. pattern or coin that was gold plated (gilt) at the Mint and then overstruck. 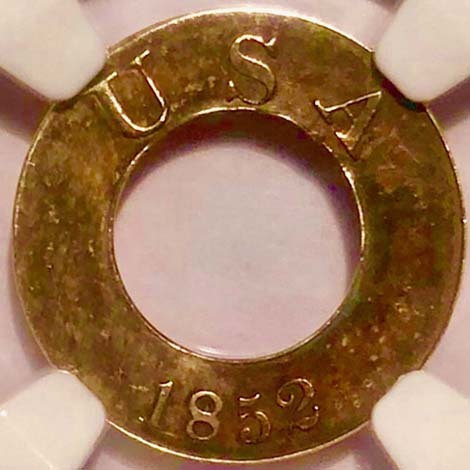 It was originally a silver Seated Dime that was cut down (trimmed to size), perforated creating a hole in the center, gold plated (gilt) at the Mint, and then struck by the 1852 gold $1 pattern dies. 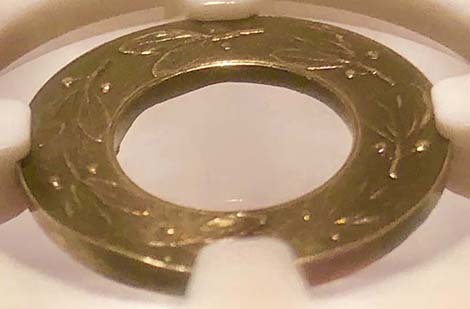 This unique pattern should not be confused with U.S. patterns that were struck first, then gilted either inside the Mint or by collectors after they were released. This discovery pattern was manufactured in a completely different way inside the U.S. Mint. It was gold plated (gilt) on a cut-down Seated Dime prior to being struck by pattern dies. To date, this is the only known authenticated and certified by NGC or PCGS, pattern struck on a coin that was gold plated (gilt) first! It was determined that the gold plating (gilt) was applied at the U.S. Mint prior to striking this pattern. 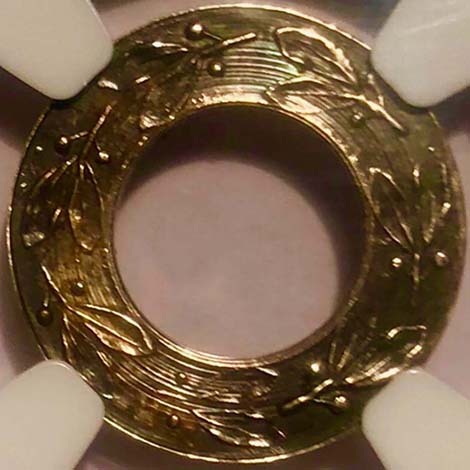 Careful examination of the cut-down edge, the striations around the center hole that was perforated and the overall surfaces confirm that it was gold plated (gilt) first, then struck as a pattern. Gold plating is the process of applying a thin layer of gold to the surface of the coin through a process called electroplating. Gilt is a process of applying a fine gold powder or gold leaf to the surface of the struck coin, without the use of electric current. The 1852 Gold Dollars were struck in various metals: Gold, Silver, Copper, Copper-Nickel, Nickel and Brass. There are also (2) known Judd #147 Gold Dollar patterns that were gilt after they were struck, a MS-62 PCGS and a PR-65 PCGS. This unique pattern, Judd #138, struck on a gold plated (gilt) cut-down silver Seated Dime, clearly demonstrates that the U.S. Mint was experimenting with the manufacturing methods and production to strike these Gold Dollar patterns. Different metals were used as blank planchets, they were perforated, and a few were struck on silver dimes instead of blank planchets. 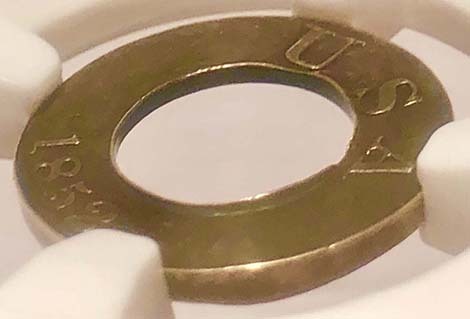 This new unique discovery is an important part of numismatic history because it proves that the U.S. Mint gold plated (gilt) a struck coin first, prior to using it to strike a pattern and gives insight into the experiments used at the time. 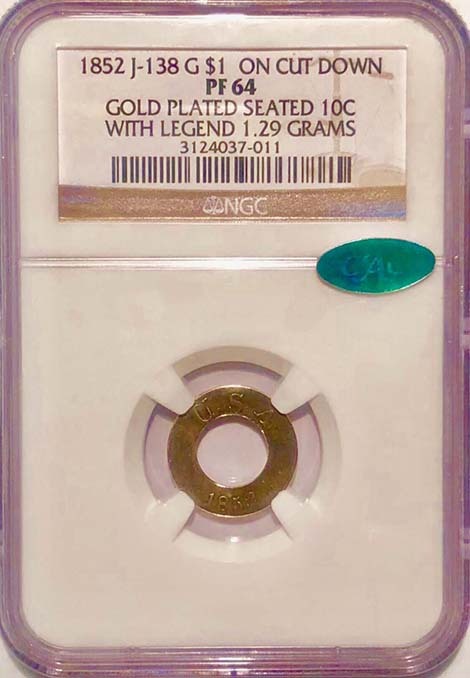 "It's the first U.S. Mint gold plated (gilt) pattern that has been certified and authenticated by either PCGS or NGC, that was struck over another U.S. coin." This unique pattern would be the highlight and centerpiece of a collection of U.S. patterns, experimental coins or cherished as a unique rarity and discovery coin.